The Secretary of the Louisiana Department of Natural Resources, Dr. Chuck Carr Brown spoke in a press conference held at our NDEW event to discuss the state's VW settlement, his desire to add EVs to the state fleet and encourage other departments to follow his lead. Ann Vail, Executive Director of Louisiana Clean Fuels spoke about automaker announcements about moving to the electric drive and on her coalitions work to improve EV infrastructure in the state. Two local TV stations covered the press conference. We had a map of the downtown EVSEs next to the podium with 6 EVs around the media beacon in our Town Square. 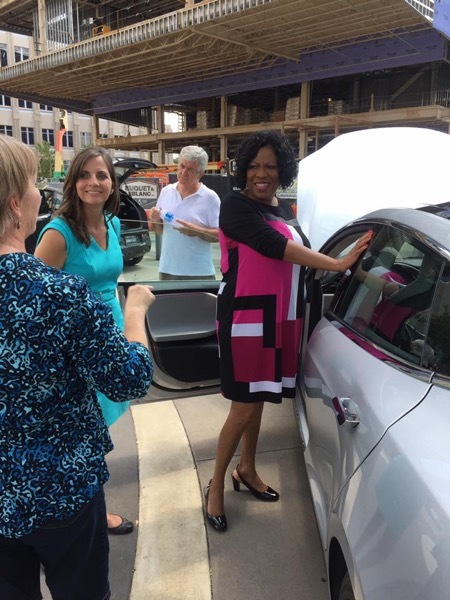 Mayor President Broome, of East Baton Rouge Parish attended and spoke with the vehicle owners and took photos with the attendees. She posted photos of her visit on her social media pages as well. The head of the Energy Division of the Louisiana Department of Natural Resources, Paul Miller also attended the event. Please keep checking our photo gallery as my staff uploads their pictures throughout the day. 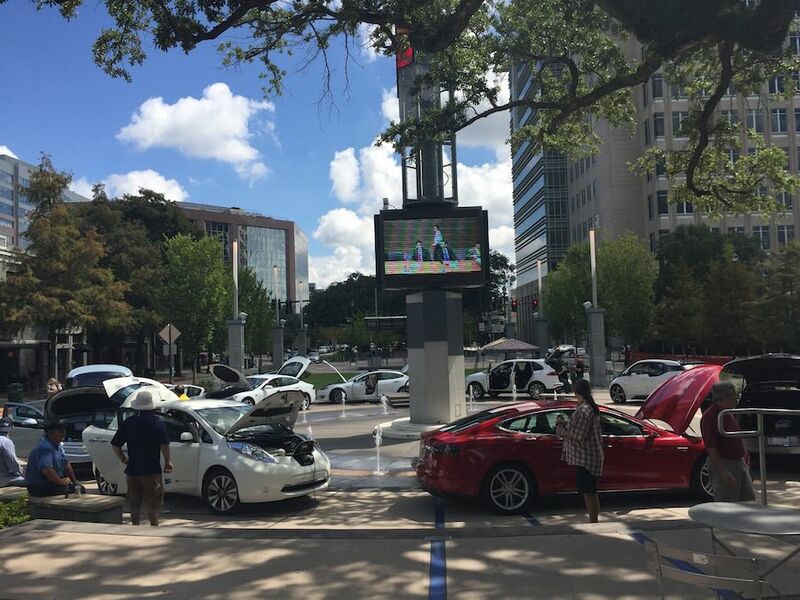 Celebrate Baton Rouge EV Day with us in Town Square! National Drive Electric Week, September 9-17, 2017, is a nationwide celebration to heighten awareness of today's widespread availability of plug-in vehicles and highlight the benefits of all-electric and plug-in hybrid-electric cars, trucks, motorcycles and more. There will be a variety of EVs on display including those from Nissan, Tesla, GM, and BMW. Update! We will host a press conference at 11:30AM featuring LDEQ Secretary Dr. Chuck Carr Brown who will give us an update on the state's plans for the VW Settlement funding and his desire to add EVs to the state fleet. The Mayor President of East Baton Rouge will stop by between 1-1:30PM and State Department of Natural Resources' Technology Assessment Division Director Paul Miller and DNR Undersecretary Beverly Hodges are also expected to attend. Join us at Town Square in downtown Baton Rouge to learn more about these great cars and talk to people who own them and love to drive them. We will also show EV themed MotorWeek episodes on the media beacon with a press conference at 11:30AM. School groups are invited to join us on the town lawn. Stop by early and pick up some cool #NDEW2017 swag. Keep checking in with us for more details as they become available! Your host is Louisiana Clean Fuels, a designated Clean Cities Coalition serving 56 parishes across the state. The mission of Louisiana Clean Fuels, Inc. is to advance the nation’s environmental, economic and energy security by supporting local actions to diversify transportation fuel options. As a member of the Department of Energy’s Clean Cities Program, LCF strives to achieve its goals by employing a variety of strategies which include: promoting and implementing the use of alternative fuel vehicles, fuel blends, increased fuel economy, hybrid vehicles, and idle reduction technologies. Registered attendees report 118,826 electric miles driven.